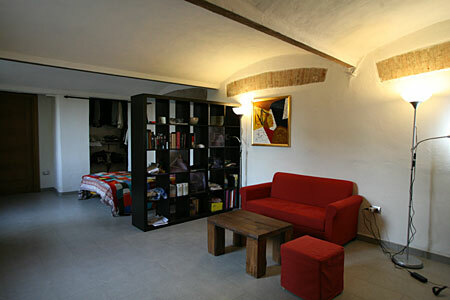 home > agritourism > the apartments > flat "Volto"
Apartment composed of single large studio on the ground floor with independent entrance directly from the garden. The vaulted ceiling from the end of the eithteenth century make it particularly special. For the evening, light from standing lamps exploit the volumes of the ceiling. The bathroom is very spacious, with a niche for the toilet area separate from the sink and shower. The construction of the original stable has been highlighted as decorative elements.